automated hot-stamping press systems, ideal for stamping high-strength alloys without the worry of springback. The press systems evenly heat a steel blank, form it at precise forming pressures and then cool the formed part at controlled temperatures in the die. A uniform quenching or hardening/cooling process takes place while the hydraulic press dwells for a few seconds. Because the parts cool rapidly in the die while the press dwells, springback is minimal. 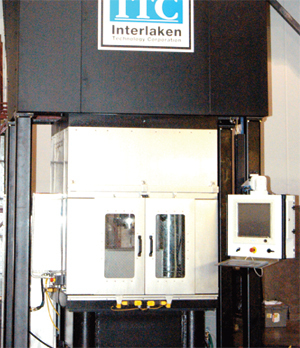 The automated hydraulic-press system can be configured to manufacture a variety of parts. With quick-change dies and tooling, the press is quickly configured to run a new part with very little downtime. Several quality-assurance features have been included in the controller to ensure proper system operation, and system alarms can be set to notify operators of changes detected in any step of the hot-stamping process.